Preheat the oven to 140°C/275°F/Gas 1. Season the flour generously with salt and pepper. Roll the lamb shanks in the seasoned flour until coated. Heat the oil in a heavy-based frying pan over a medium heat, add the lamb and fry until the meat is coloured all over. Transfer the lamb to a deep roasting dish and add the chopped vegetables, garlic, rosemary and anchovies. Blend the tomato purée with the wine and Worcestershire sauce and add it to the pan, then add just enough stock to cover the lamb and vegetables. Cover the dish loosely with kitchen foil and cook in the oven for 3 hours. The lamb shanks should be soft and the meat should come off the bone easily. Meanwhile, cook the pearled spelt in boiling water for 20 minutes, or until tender, following the packet instructions. Drain. Lift the lamb out of the dish, cover with kitchen foil and leave to one side. Strain the cooking liquid through a fine sieve into a saucepan and discard the vegetables. Bring the sauce to the boil over a high heat and boil for a few minutes until reduced by about half. Stir in the honey for extra stickiness and the butter for gloss, too, if you like. 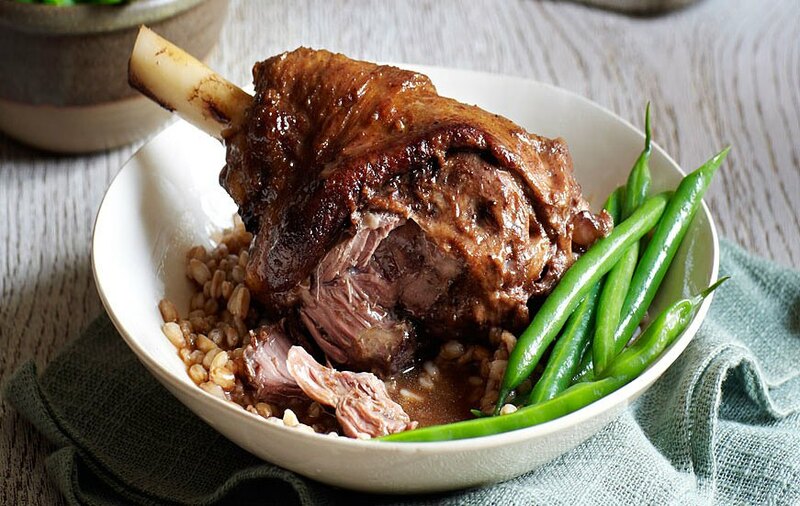 Turn the heat down to low, add the cooked pearled spelt to the sauce and warm through, then add the lamb shanks, cover them with the sauce and gently warm through before serving with seasonal vegetables of your choice, such as carrots, broccoli or peas, or a fresh green salad with herbs. Published by Nourish Books, London.